Right-of-way Natural Resources: Maintenance practices--problems or protection. Mowed and edge-sprayed portion of Hwy. 99, Sacramento Co., Post Mile 36.00, jct. Everta Rd. 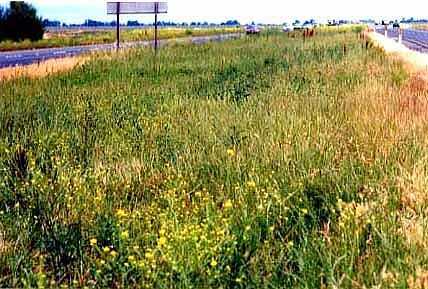 Unmowed portion of Hwy 99, Sutter County, Post Mile 3.00, junction of Sankey Rd. RIGHT-OF-WAY NATURAL RESOURCES: Maintenance practices today can cause long-term problems or could protect the natural resources for decades into the future. 1. What is there about low-mowing (to a level of 2-3" tall, as shown above) that can have a negative impact on a DOT's ROW natural resources for decades into the future? 2. What is there about not mowing that can have a positive effect for a DOT's ROW natural resources for decades into the future? 3. If you adjusted the mowing height by a few inches, what percentage of the native plants in the right-of-way may be able to survive? At a one-inch mow height? Two inches? Four inches? Six inches? Eight inches?